Enterprise IT departments are being pulled in many directions today. Not only are they struggling to keep up with the staggering increase of network traffic in the data center, but also users are demanding new and updated systems to support the workloads that drive the business. Expectations of quality and service from IT are at an all-time high. IT leaders feel the pressure to get the most value and performance out of the data centers, which is particularly challenging as the cost of manual operations and facility optimization mount, and unplanned downtime—often due to human error—escalates. Change is needed in the data center. Enterprises can benefit from moving to more intelligent, easier to manage systems that reduce IT management tasks and thus keep IT costs low and returns on investment high. Increasing hardware utilization and simplifying management are key components to creating an environment that supports the business and helps employees reach their goals. 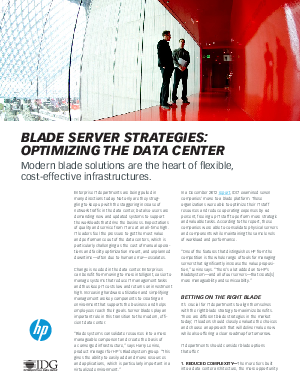 Server blades play an important role in this transition to the modern, efficient data center.